Michele: Wow, so let's get on with the mission. Buckle-up for landing, everyone! Midgel: Coming up on Bullamanka. Zidgel: Uh... Buckle-up for landing, everyone. The Cheating Scales of Bullamanka is the second episode in the 3-2-1 Penguins! series; written and computer-animated by the folks at Big Idea, the show has the same charm and wit as their wildly popular VeggieTales videos. It's now Michelle's turn to be visited by the penguins�Zidgel, Midgel, Fidgel, and Kevin�space travelers who try to keep peace in the galaxy, though they're kind of dumb, which makes it difficult. There's a cute reference to the impossibility of the penguins' visit�"Wow, you are alive," says Michelle, to which Midgel replies, "Or you could be daydreaming." Yet another show where kids are left on their own to hallucinate. Everyone zooms off together to the planet Bullamanka, where the Bandicoot King is being held prisoner by an Aussie Lizard. It seems the lizard cheated during the championship game of "real life" Squid-Tac-Toe, and is holding the King hostage. It's up to Michelle, Earth's Squid-Tac-Toe champ, to save the day. But can she do it fair and square? The Cheating Scales is even more fun that the last episode, Trouble on Planet Wait-Your-Turn. The jokes fly by at hyper speed, with most of the humor coming from the goofball interactions of the penguins. A few running gags are introduced, referencing events in the previous show�keep an eye out for President No-I'm-the-President, still floating in space, even as the penguins continue to experiment with their landing gear ("Landing gear?!"). The animation is remarkable, especially for a direct-to-video release. The full-sized game of Squid-Tac-Toe is creatively staged and innvoatively animated. Several former employees of Pixar now work at Big Idea, and their experience certainly shows up on-screen. Once again, the real appeal of the series is that it doesn't pander to children, including as much humor for adults as for the wee ones. The moral messages tend to be rather overt, but the scripts are never preachy�Jason and Michelle discover what's the right thing to do; they are never told. Zidgel, Midgel, et al have certainly earned their places next to Bob the Tomato and Larry the Cucumber. Note that this episode also includes the first Penguins' music video, for the song Fair and Square. The opening act is a ventriloquist robot that cracks jokes about being "carbon-bonded to the chicken", and this is, trust me, far more amusing that it sounds here. Image Transfer Review: Not a lot to say about this one, except that it looks wonderful. Colors are rich and saturated, with nice solid blacks. Compression artifacts aren't a problem; nor is edge enhancement. I spotted some unobtrusive aliasing in a few shots, though. Easily on par with the best CGI DVDs from Disney and DreamWorks. Audio Transfer Review: The 5.1 English mix adds a bit of pep to the show (which also sounds fine on an included 2.0 track). Dialogue is anchored in the center channel and clear, with the front mains spreading out the score and sound effects with good directionality. The surrounds aren't utilized all that often, but they do provide some support during songs and flying scenes. Extras Review: Like other DVDs in the series, this episode includes a nice mix of features for both kids and adults (though all of it will likely appeal to the whole family). I still say some more behind-the-scenes info would be nice, but I can't complain about what's actually here. First up, under the menu selection Behind the Scenes, is a nice collection of goodies for animation enthusiasts. Two "How to Draw" featurettes, each running a little over two minutes, teach you to draw the koala or the Lizard King with help from a Big Idea animator. A Progression Reel offers a storyboard to final animation comparison in split-screen. And the Concept Art gallery offers a peek at some early incarnations of several different characters. Selecting Penguin's World takes you to another page of features. The 3-2-1 Bios! are identical to the ones that appeared on the last Penguins! disc. Space Academy School (Course 201) teaches you how to pilot the penguins' ship (which will be very helpful if you ever wander into the Land of Make-Believe). Finally, there's another audio commentary featuring the penguins speaking in character, along with director Ron Smith. I was a bit unenthused by this feature on the last volume, but this time around, I found it to be far more entertaining. Basically, the penguins and Smith watch the feature, occasionally cracking jokes about what's on-screen�Smith gets in a good line about John Woo being brought in to direct a scene. There's far too much dead air, but it's still worth flipping the commentary on the second time you watch the episode. Hey Kids! houses most of the extras. The gallery of interactive games is very similar to those on the last disc in the series. Space Maze! and Hide & Seek are both fairly simple�kids should have no problem playing them using the remote control. A set of 10 episode-specific trivia questions, when answered correctly, will net you some bonus footage about real world penguins. There's a karaoke version of the song The Seats on the Ship (from The Amazing Carnival of Complaining), and a storybook version of that episode as well. This time around, the Recipe from Space is for Lizard King Krunchies, which seem suspiciously similar to caramels brightened up with green food coloring. Video instructions are provided for a Family Fun Activity (which actually looks fun this time), a game that reinforces the episode's lesson about cheating. 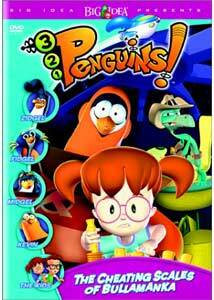 A promotional gallery features spots for other Big Idea releases, including Heroes of the Bible, Jonah: A VeggieTales Movie, LarryBoy, 3-2-1 Penguins! : Trouble on Planet-Wait-Your-Turn, and 3-2-1 Penguins! : Carnival of Complaining. And on the DVD-ROM side, we've got a coloring book that can be printed out and the complete script, in rich-text format. The back of the box promises easter eggs; I found two. On the special features menu, click left from Rom Stuff for a brief interview clip with one of the voice actors. On the Hey Kids! page, clicking right from Return to Features nets you a trippy penguins kaleidoscopic screensaver. If the categorization of 3-2-1 Penguins! as "Christian entertainment" puts you off, don't let it. True, the stories do carry morals that are Biblically-based, but the scripts handle the scripture with subtlety�the creators want to entertain and educate kids, not to preach at them. Seriously, where in the Scriptures are there mentioned four talking intergalactic penguins? And no, oddball interpretations of Revelations don't count.